Understanding the 5 Building Blocks of Verbal will help you assess and plan your preparation for each of these 5 blocks. Use the 5 building Blocks and No.of Questions expected to plan your preparation. Under no circumstances should you ignore high weightage areas like RC. Also, Vocab is not the only area that is being tested. Do not use your entire Verbal Preparation time learning Word Lists. CAT is not a Vocab intensive exam – it is focused on usage of words and not than testing of obscure words that you may have memorized from standard word lists. Be Brutally honest with this assessment. Look at your performance in the last 3 to 5 Mocks and Sectional Tests you have written. Scores Below 4 indicate Below Average Preparation. Buck Up !!! Scores of 4 & 5 Indicate Average Preparation. Work on it – average will take you nowhere. Scores of 6 & Above Indicate Good Preparation. This is where you should aspire to be !! Calculation your weighted score by multiplying Total Score ( row 4) by the weigtage given. Add the score for each section. Scores of <3 indicate – Poor Preparation. You really need to do something dramatic to change things around. Was this a Wake-Up call for you ? Please fill the below 2*2 Matrix ( Consulting Approach helps 🙂 ). Again, use data from last 3-5 Mocks. Strength Quadrant : ( High Accuracy, High Strength) : Ideally start Section2 in Mocks/Actual CAT by attempting these questions. Also, do not ignore preparation just because it is a strength !! You need to practise regularly since most of your marks come from this quadrant. Most likely candidate is Parajumbles. Possible Strength : ( High Accuracy,Low Attempts): Low attempts can be due to low time allocated during test. 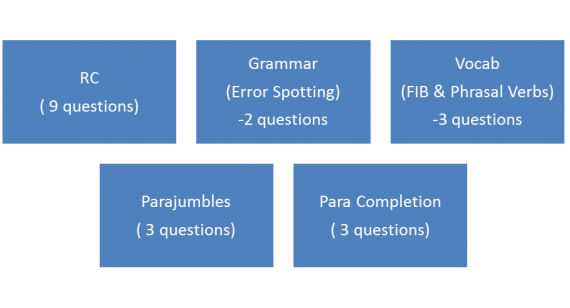 Practise these areas in timed-test format. With practise, this can move to strength quadrant . Revisit the same evaluation exercise after 5 more Mocks and see if this has moved to strenth area. Possible Candidates : RC, Vocab. 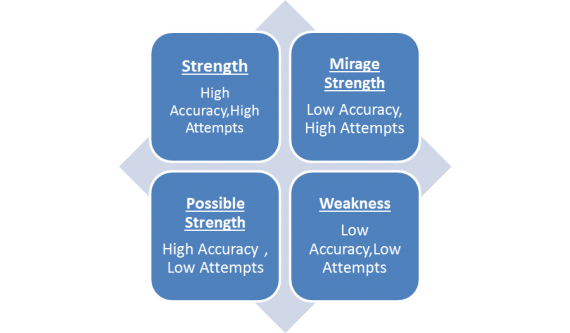 Mirage Strength : (Low Accuracy, High Attempt) : You are being tempted to attempt these questions when you should be leaving a few unattempted. Treat these building blocks as weaknesses and devote extra time over the next 3 weeks. If it does not move to above 2 blocks over next 5 tests, please avoid attempting these questions in a Mock. Possible Candidates : Paracompletion, Grammar. Warning 1 : If RC is in Weakness Quadrant, you cannot afford to ‘ignore it’. For Each Building Block, I have created 2 versions of the plan. Use ‘ Plan A’ if it is in Strength Quadrant OR It is a weakness you cannot improve on. Use ‘Plan B’ for possible strengths & Mirage strengths. With extra practice, it will lead to higher accuracy and hence higher scores. Re-evaluate position after 20 days to alter study plan accordingly. 25 Questions in 35 minutes. Solve once a week. 25 questions in 35 minutes. Solve twice a week Once you know basic concepts, focus on question solving. Grammar Theory is vast and studing entire theory is not the best utilization of time. CAT focuses on Usage and not obscure rules of grammar. 25 Questions in 40 minutes. Solve once a week. 25 questions in 40 minutes. Solve twice a week Easiest topic to master. I really think, you need to master this and ensure 2-3 right answers in every mock. 25 Questions in 50 minutes. Solve once a week. 25 questions in 50 minutes. Solve twice a week Readers have a natural advantage here. Phrasal Verb List –20 mins everyday.Fill-in-the-Blanks : 25 questions in 25 mins- twice a week Phrasal Verb List –20 mins everyday.Fill-in-the-Blanks : 25 questions in 25 mins- thrice a week Word Lists you should know : High Frequency List ( 1000 words), Confusable Words ( 500 words). Revise 1 week before CAT. 2 Sectional tests per week. Give yourself 45 mins 2 Sectional tests per week. Give yourself 45 mins This will help refine your test-taking strategy. 2 Sectional tests per week. Give yourself 45 mins2 Sectional tests per week. Give yourself 45 minsThis will help refine your test-taking strategy. It is best to write 20-30 Full Length Tests before Actual CAT. Write 1 or 2 tests a week now ( Aug) and gradually increase frequency to 3-4 a week. No point writing 2 tests a day !! 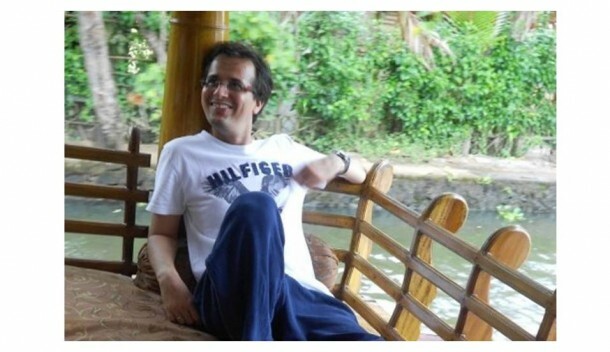 Hemang Panchmatia (MBA from NMIMS, Batch of 2005) is Co-founder and Head of Verbal Dept at CREDence Academy (Mumbai’s only personalized coaching institute) He has trained 2500+ students in the last 4 years. With 5000 hrs of Verbal teaching experience, he is well-known among students for simplifying Verbal and making it ‘solvable’. He is credited with bringing structure to Verbal Preparation and students vouch that Hemang Sir’s ’90 minute Verbal-a-day’ approach really works .When not in class, he loves reading and watching Bollywood movies. Hemang also has 4 years of Corporate Experience in Financial Services Space. CREDence Academy provides personalized, high quality coaching for MBA Entrance Exams. Based in Mumbai, it has trained 1500 students in the 3 years. 1 in 4 CREDence students make it to the Top 30 B-Schools – thanks to the rigorous teaching methodology. CREDence faculty members are known to go that ‘extra mile’ – be it GD Preparation or doubt solving. Its really a great help !